I’m not much of a beach person, honestly. I’m more of a mountain person. I prefer the cold temperature, foggy mornings, spectacular view, and laid-back environment of the mountains compared to the humid, harsh sun rays, vast and giddy sea, salty, painful-to-the-eye waters and its creepy creatures. I have a slight “phobia” of the sea. Its vastness and depth inject terror in my mind. It scares me when I look at the sea at night and hearing its waves. So when people post travel photos of the beach, or the ocean and when they make it synonymous with paradise, I am like “Oh, it’s another overrated review by a westerner who has no warm, beautiful, beach in their country." So for me, a beach experience is just so so. Well, I haven’t been to the best beaches in the Philippines- maybe that explains my perception-like El Nido, Coron, Boracay, Pamalican Island. But I’ve been to countless wonderful beaches too, like Glan, Saranggani province, Dinadiawan, Aurora, the beach near the underground river in Puerto Princesa, Palawan, Panglao, Bohol, Samal, Davao, and the non touristy beaches in Samar and Pangasinan. My perception regarding beaches changed when I encountered this wonderful bay in an uninhabited island in southern Thailand in a province called Krabi. 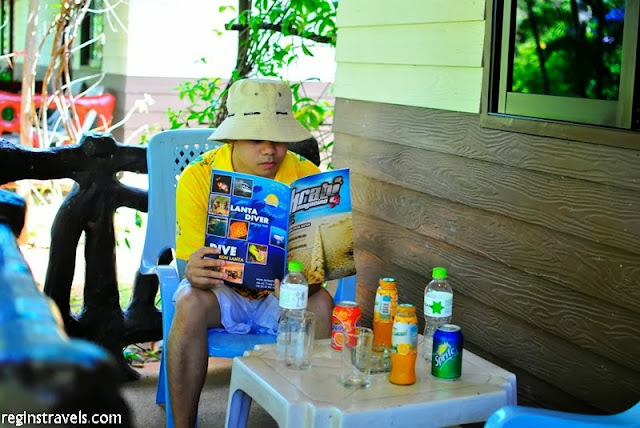 We were on a 5-day Songkran (Thai New Year) holiday and we escaped the busy Bangkok and its disgusting summer heat. Our main destination was Maya Bay, the set of the movie The Beach starring Leonardo DiCaprio from Alex Garland’s novel. It’s in an island called Phi phi Leh, about 30 min. 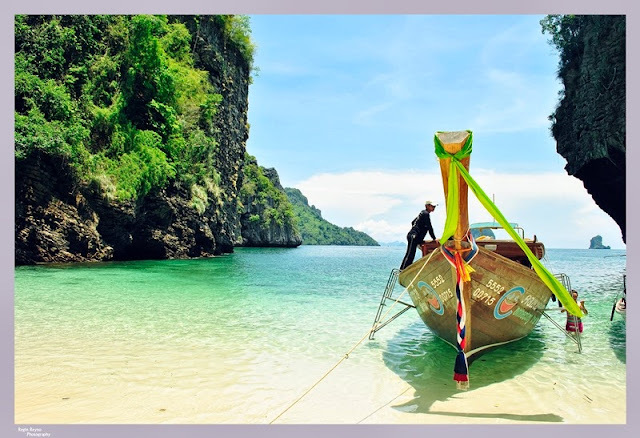 to 1 hour by boat from Aonang, Krabi. But since there was an earthquake during that time in Indonesia and a tsunami warning was issued, we were scared to go to that island. So we opted to just relax in Aonang and explore the islands nearby. As our long-tail boat approached an island with wonderful rock formations and huge karsts, I immediately noticed its white sand bay. “It’s Poda bay sir, same same Maya bay”, said our guide. “So this is like Maya Bay?” I replied with excitement, since I really wanted to be in that beach if not for the tsunami warning. “Yes, this is just smaller” said our guide in his nasal Thai accent. Anchors away! We docked in an uninhabited island with powdery white-sand beach, clear, calm, warm emerald green waters, stunning rock formations, and it is shallow even meters from the shore. The peaceful environment, with its wonderful nature surrounding you is just awesome. Trees, vegetation on the rocks, small coves, emerald green to blue waters at a distance, this is different, this is paradise! I took some time to catch my breath, still can’t believe at the beauty of the place. The fact that it’s uninhabited makes it so fresh, preserved, and super clean. I thanked God and praised His beautiful creation at that moment. Just walking along the beach is a fantastic experience in itself-the fine, powdery white sand touching your toes, massaging your soles-I really loved it. Swimming in its water, you’ll really love it! It’s warm, clean and clear. And below is pure, soft, white sand. No rocks, stones, thorny corals, sea urchins, crabs, jellyfish and other small creepy creatures that inject painful bites and stings-which I really hate when I go swimming in beaches. It’s just pure sand. The water is so clear that so can see school of fish swimming. If you want them near you, hold a piece of bread and they’re over you. Clean, clear, and warm waters. Soft, powdery, white sand. Perfect for swimming. Finally, I have to agree to most people who make beaches synonymous to paradise. I was like Richard in the movie The Beach who just found a paradise, albeit not a secret anymore. This is the best beach I've ever been to so far. Praise God for His wonderful creation. Thank you also Thai government and Ministry of Tourism for preserving this beautiful place. Where is the best beach you've been to? Yes, you should visit this beach. It's world class yet affordable. I'm always impressed to see how much adventuring you do.There are few things better than a good meal with a view.